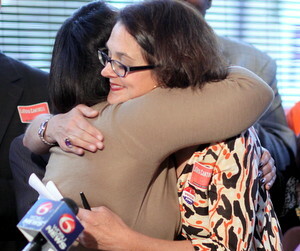 LaToya Cantrell was endorsed Tuesday morning in her bid for the District B seat on the City Council by Council President Stacy Head, a popular and influential voice in Uptown politics who twice won the seat in 2006 and 2010. Head has been a political rival of Mayor Mitch Landrieu on a number of issues lately, and her endorsement of Cantrell stands in contrast with Landrieu’s earlier endorsement of Dana Kaplan, whom Cantrell faces in the Dec. 8 runoff. Head also represents the second major endorsement Cantrell has received since the Nov. 6 primary election, following that of third-place finisher Eric Strachan earlier this month. “LaToya stood firm,” Head said. Head also said that no one has less tolerance for blight in the neighborhood than Cantrell, and detailed her extensive tracking down absentee property owners, shepherding rundown properties through the blight process, and helping other families rebuild. Among those who joined Cantrell and Head at the podium Tuesday morning at Midway Pizza on Freret Street were City Councilwomen Cynthia Hedge-Morrell and Kristin Gisleson Palmer, state Sen. Ed Murray, former District B candidate Eric Strachan, Mark Vicknair from the Alliance for Good Government, Charmaine Baker-Fox of the Orleans Parish Democratic Executive Committee and Sidney Cates and Jay Banks from BOLD. To read our live coverage of the event, see below.